I'm STILL working on Geranium House. Hopefully I'll be able to get it finished up, or almost finished tonight while watching the NEW episode of Grey's Anatomy. I feel like lately I've been spending a lot of time driving around town! After I drop Bradley off at school I meet my SIL, or go to her house to pick up Halle, and I do the same in the afternoon. That's at least an extra hour a day that I'm spending in the car. Anyway, I'm not complaining (too much) because my brother did give me a car, which I believe is partially for this purpose. Although they didn't mention it then, but we kind of figured it out. Anyway, I'm just tired. I need a vaction. A week somewhere would be great. It wouldn't have to be fancy. Just a motel room and my stitching with a great stitching shop close by. That would be heaven! :) Enough rambling, here's my wip! 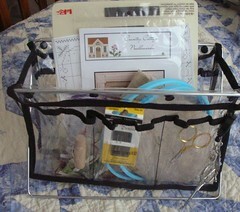 And I picked up a couple charts yesterday and a "Handy Caddy," which I love by the way. Like I wrote previously - I just love new gadgets for my stitching! 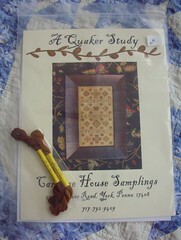 CHS "A Quaker Study" with NPI Silks. Prairie Schooler's "Rain, Rain, Go Away." I saw the cutest Rain, Rain, Go Away Needlebook on Argone's site (see my shared items on the left), so I had to have this chart. Nothing else going on right now - TGIF tomorrow! :) Write later! That caddy looks very useful. 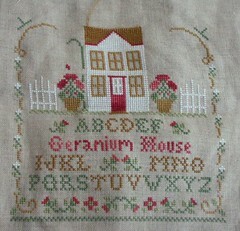 You're nearly done with Geranium House - looks gorgeous! Nice stash and caddie! 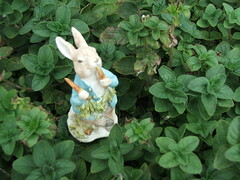 Love your Geranium House. Geranium House is looking so good! I love it! Let me know when you get your fabric and we'll work out a start date. CathyMK is starting over too. Great progress on Geranium House! It's so pretty. Great stash! 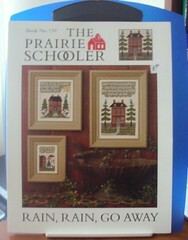 That needlebook is so cute - I may have to get this chart too.